Cleveland Roller Mill Museums current exhibitions through Labor Day weekend. "Valley of the Mills" This Exhibit provides information on the mill's history, and wheat farming and milling in Mora County, as well as a historical overview of the history of western Mora County. Wheat farming and milling were Mora Countys most important economic enterprises for nearly a century encompassing a time period from 1860 to 1940. Mora County: The early years. This photo exhibit includes 80 historic photographs relating to the architecture, landscape and personalities during Mora Countys early years. Museum Hours: Memorial Day weekend to Labor Day Weekend: 10am to 3pm weekends only. Admission is Free except during the Millfest on Labor Day Weekend. From Santa Fe/ABQ: drive north on I-25 to Las Vegas and take exit 343, and get on hwy 518 and drive 32 miles to Cleveland, NM (2 miles north of Mora on Hwy 518.) Turn right at the Cleveland Roller Mill sign. Travel time is about 1 hour 45 minutes from SF; 2 hours 45 minutes from ABQ. From Taos: drive 44 miles southeast on Hwy 518 to Cleveland. Watch for the Mill sign on the left side of the road and turn left at the sign. Travel time is approximately 1 hour. The Cleveland Roller Mill Museum is located in a flour mill built at the end of the 19th century and operated until the early 1940's in the beautiful Mora Valley in northeastern New Mexico. The mill's machinery remains intact and has been restored significantly to the point that it can be operated for demonstration purposes. The museum preserves the history of milling in northeastern New Mexico through photographs, documents and physical exhibits and makes this unique history available to all who wish to see it. We now are placing this history and images on the web in order to enrich the lives of people who are unable to travel to the mill site to view the museum in person. 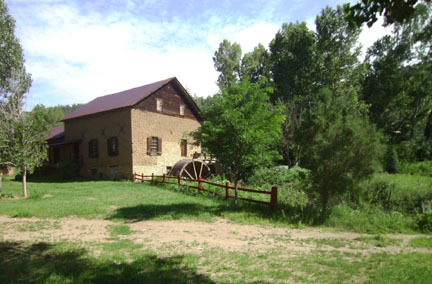 A 'molino' (Spanish for grist mill), on loan from the Palace of the Governors in Sante Fe is located on the mill grounds and open for public inspection. The Spanish first mentioned their use of molino technology in New Mexico in a report dated from 1601. 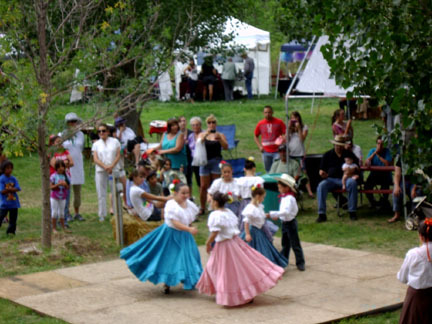 Every year since 1987, on the Saturday and Sunday of the Labor Day weekend, the museum hosts a millfest which consists of an arts and craft show, music, food, and historical presentations in front of the museum and the operation of the mill and its machinery. Admission to the grounds is free. During the Millfest, the museum has a nominal charge of $3.00 for adults, $1.00 for youth 18 and under. The admission fee helps to maintain the museum and exhibits and any donations made to the museum are tax deductible. Historian available for group and school tours. Please call us about hosting Weddings and other events at the museum.